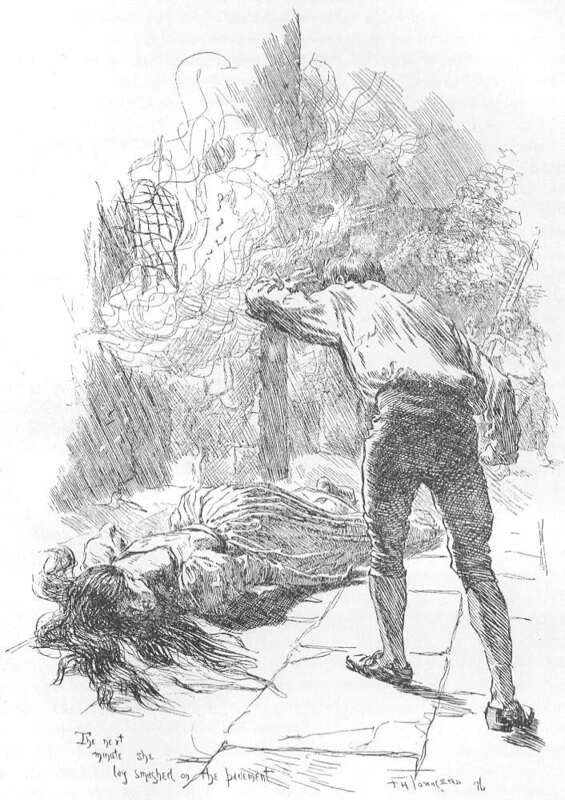 Engraving by T. H. Townsend, taken from the second edition of Jane Eyre (1847). Bertha Rochester smashed on the pavement. The phrase “the madwoman in the attic” is the title of the groundbreaking book of feminist literary criticism by Sandra Gilbert and Susan Gubar written in 1979. These scholars introduced a revolutionary approach to the exploration of the works of female authors of the nineteenth century. Their rereading was aimed at uncovering the patriarchal influences in their work and their use of ‘metaphorical trousers’ which goes beyond the use of male pseudonyms, as the Bronte sisters did, and examines the use of strategies used to disguise their criticism of patriarchy. The first Mrs. Rochester, née Bertha Antoinette Mason was the original madwoman in the attic. Bertha is undoubtedly the most famous literary representation of madness in English literature. Her husband, the romantic hero, of Jane Eyre, Edward Rochester, confined his allegedly mad wife in the third story of Thornfield Hall for eleven years in a windowless room. Bertha Mason is a denied a voice and a life. She lives like an animal, does not see the light of day, and is deprived of any basic human dignitiy, such as clothes or basic hygiene. A drunk and negligent carer is her custodian while he proclaims he is a bachelor. Let us recall the reasons which led to her dismal situation. Edward Rochester was his father’s second and youngest son, who was banished to the colonies, to marry a wealthy Jamaican heiress, while his older brother, Rowland was destined to inherit the family estate. When Edward arrived in Jamaica to comply with the arranged marriage and gain her generous dowry, he discovered that Bertha was Creole and came from a family of mad women; a fact which did not deter his determination to marry her and claim his dowry. It would seem, perhaps because he was a member of the English gentry, that an honest occupation was out of the question. A dowry was his only option, and he accepted it eagerly, in spite of his wife’s ethnicity and family history. Edward Rochester, who was a fortunate man, finally did inherit Thornfield Hall and the Rochester Estate, because his father and his brother both died four years after he married Bertha. He was then free to return to England, with his mad wife, and reclaim his inheritance. He decided to lock Bertha away and travel around Europe, living the gay life of a rich bachelor with his wife’s fortune in his pocket. It was during this time that he had an affair with the French opera singer, Céline Varens, which resulted in the birth of Adele, although he always denied paternity. It was to look after Adele that Jane Eyre first arrived at Thornfield Hall. The idea of a married woman locked in an attic by her husband is repulsive to contemporary audiences. However, Bronte’s readership in the middle of the 19th century would have considered that Mr Rochester’s refusal to place Bertha in an institution denoted nobility, not perversity. (See Sarah Wise in Psychology Today) Even England’s private asylums used brutal measures such as the use of strait-waistcoat, manacling, the darkened room, and the cold-water-shock treatment. Families with a mad relative often confined the person at home without the need of any legal or medical certification, and sympathy was shown to those who cared for their insane at home, often secretly, due to the shame the situation cast on the family. However, Edward Rochester’s inhuman brutality towards Bertha Mason, seriously mars his already damaged integrity. Jane’s acceptance is no less troubling. The only explanation of Jane Eyre’s benevolence with the perpetrator of such a foul deed is the fact that she was in love with Rochester. Jane is prepared to believe everything Edward says, and forgive him for anything he does, and that’s understandable, within the context of the novel. However, it also makes her an untrustworthy narrator. We must remember that Jane left, not because Rochester treated his wife inhumanly, she left because he was legally married, although she pitied him for having to bear the burden of a lunatic. On the other hand, Jane’s complacent acceptance need not extend to the reader, who is not in love with Mr. Rochester. Charlotte Bronte herself exposes Rochester as a liar and a scrupulous manipulator; he even tries to convince Jane to live with him as a concubine, knowing full well that the consequences would be devastating for her. Bertha is silenced, yet quietly and powerfully present throughout Jane Eyre, until her presence is disclosed by her brother, Richard Mason, at Rochester and Jane’s first marriage attempt. There is no first hand information about Bertha in Jane Eyre, so wanting more, Jean Rhys decided to write Wide Sargasso Sea, in three parts. The first is from Bertha’s point of view. We discover all about the beautiful young Creole who was forced to marry Edward Rochester by her step-father and brother. There is no madwoman in the first part. The madwoman emerges in the second part, after Rochester cashes her dowry, and especially after her husband inherits Thornfield, decides to return to England and locks her away in his cold damp attic. In my novel, All Hallows at Eyre Hall, Bertha is once more a central, albeit absent, character, who has been dead for twenty-two years. I have given Bertha to a stronger voice through her daughter, who was torn away from her mother at birth in the attic, and taken to Jamaica by her uncle Richard Mason. She returns to Eyre Hall to rock the lives of the Rochester family. What is Bertha’s daughter like? What will her impact be in the family? How will Jane Eyre and the rest of the family react to her presence?